Reading so many military history books covering WWI and WWII I started to notice one company in particular never let me down. Every book I read that came out under their name I enjoyed from start to finish. Infact many I'd have happily placed in my top ten book list and those that didn't wouldn't be far off. This company is Helion. Though they fall under Casemate (who also publish great reads) if I see a book that looks interesting and then I note it's published by Helion it becomes a definite buy. So if a book has caught your eye, but maybe you're in two minds check to see who publishes it. If it's Helion then I say buy it! So when I noticed this book was published by Helion I knew I had to read it! I had to review both volumes for the blog! Funny enough though I've read alot of WWI books I haven't read any that are based around a particular regiment rather than an individual soldier. Actually I tell a lie, the excellent series by Jack Sheldon "The German Army on\at...." and the superb "The Otherside of The Wire" by Ralph Whitehead (more on that later) are along similar lines but covering a German Army\Corps, were this two volume set covers a renowned British regiment. "The Otherside of the Wire" By Ralph Whitehead (Helion) is actually my benchmark when it comes to in-depth research by an author. This series easy has a place in my top ten books of all time. Ralph's research into the soldiers mentioned in the two volumes currently released is amazing, the best I've read so far and I thought no one could do it any better. 'Till The Trumpet Sounds Again I hoped would be just like "The Otherside of the Wire" but this time looking at a British unit. So everything is in the books favour, will it come close to "The Otherside of the Wire"..
Well, as soon as I started reading I knew this was going to be something special. 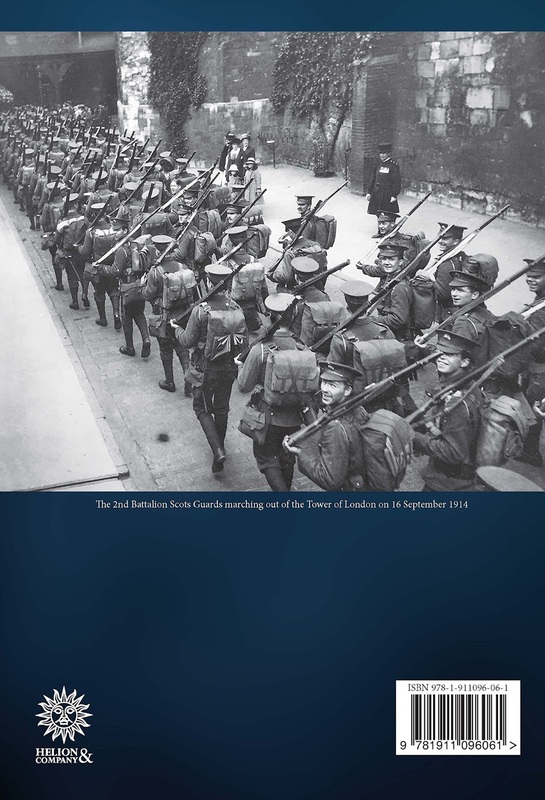 The book starts with the 1st Battalion Scots Guards, about to leave the UK and then follows them as the cross the channel and head towards their first engagement and the battle of Mons, it then stays with them through the long retreat and then finally the counter attack and the battle of The Marne. It soon becomes apparent how much research the author has done. More or less every soldier mentioned in it's pages, esp those that die or are wounded in any actions mentioned (if wounded it says if he gets sent back to the frontline or not) have their background described, were they lived, when they signed up, their previous job, who they are married to, who their parents were, if he had any children, if he had been in any trouble whilst in the ranks, even down to any tattoos he has and where and what they are of! I love this sort of detail! The author has used not only the regiments diary but also letters sent to loved ones and any interviews taken after the War. At one point I was reading extracts from a letter written by a Officer, during which he has to break off from writing due to a barrage. He then continues to finish the letter. A couple of paragraphs later this same Officer is killed and you find out the letter was taken out of his pocket and sent to his loved one with any other personal articles he had had with him when killed. He had just been told his wife was expecting another child. It's this sort of detail that brings it all home. For me makes it all real and keeps these men in living memory. The second chapter then goes to the 2nd Battalion who crossed later than the 1st. It follows them through the first battle of Ypres, a terrible baptism of fire. The third chapter then goes back to the 1st battalion and describes their experience of "The First Battle of Ypres". The two volumes continue in this way going back and forth between the two battalions, yet it never gets confusing and is very easy to follow. Volume 1 goes from 1914 to July 1916 and the start of the battle of the Somme. Volume 2 carries on were Volume 1 finished right through to 1919. A slightly smaller book than Vol 1 it doesn't let you down. I'm sure after finishing volume 1 you'll want to get Volume 2 as soon as possible. R Nicol hasn't let the men of the Scots Guards down and this book is a fantastic testament to their deeds through "The Great War". 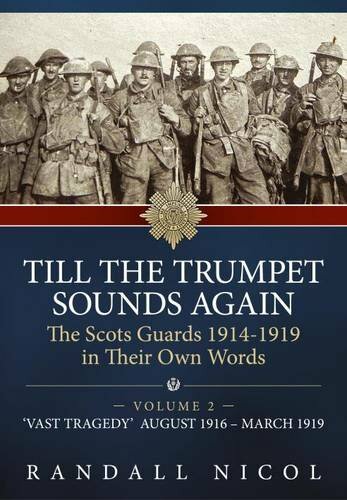 If any member of your family actually fought with the Scots Guards during WWI this is more than just a must buy..you HAVE to buy it! Now did R Nicol manage to uphold my feelings about Helion and did he infact come close to "The Otherside of the Wire", what I consider to be pretty much the perfect military history book? Well yes and no. Yes I still see the name "Helion" as a mark of a good read but coming close to "The Otherside of the Wire"? A tough ask and I have to say he didn't just come close, he matched, if not over took Ralph's work in my top ten list! I mean achievement. I have no hesitation in recommending this superb series. It had everything I want in my history books in spades, with a cherry on top! It definitely goes in my top ten if not top five books of all time. Again Helion didn't disappoint. Helion must be the jewel in Casemates crown! It will be a long time, if ever, before I forget the men of the Scots Guards and their experience of WWI which is all thanks to R Nicols superb research and writing skills. If you're like me and love books that take you down to the frontline and the experiences of the soldiers and officers in the line then this two volume set is a must buy. Even if WWI isn't really the conflict you're interested in I still say buy it as I'm sure once finished it wont be the last book you read on WW1. Only if you prefer the more dry books which look at the bigger strategy etc (yawn) like my colleague Bob should you look elsewhere. If you check the book reviews on the website by Bob you'll most likely find the type of book that appeals to you reviewed there. One thing I will say is that Helion also publish the type of book that appeals to those like Bob as he too has been impressed with their offerings! 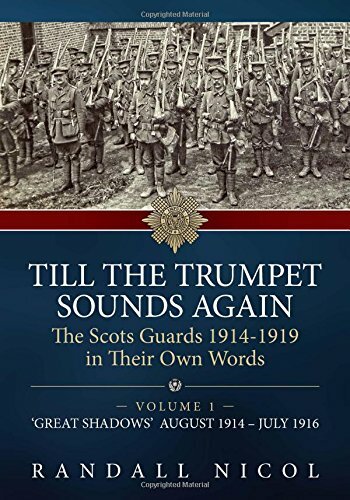 So "'Till The Trumpets Sound Again" Vol 1 and Vol 2 by R Nicol impressed me no end. Very few things will I whole heartedly recommend for people to spend their hard earned money on. I certainly don't want to do a review that entices someone to buy it on my word and then not be happy. However every now and again something comes along where I have no doubts what so ever in recommending to people and this is one of those times. If you enjoy the same sorts of books that I do then it's a no brainer...buy it! It's everything I want and more when it come to a military history book. R Nicol should be very proud! It's books like this that in recent times has made me go for the hardback edition rather than the soft back. I like to keep my books in good order. I once let someone borrow a book of mine and when it came back to me it looked like it had actually gone through the War..never again! With in the pages of this two volume set are the reasons why I became obsessed with WWI, devouring book after book on the War. Those like me will under stand what I mean by this. I hope after reading these two books that maybe one or two other people will understand what I mean and also become obsessed with WWI. That might even be you! Until the next time...happy reading!